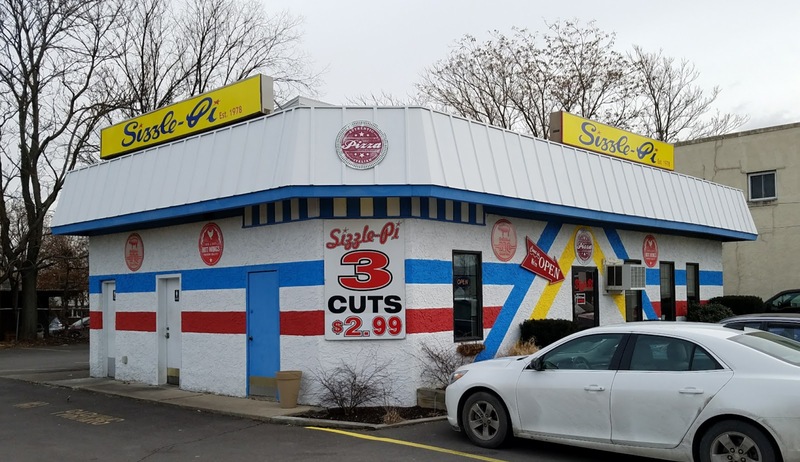 Pi is 3.14, But Sizzle Pi is 5 Star! In the course of reviewing pizzas for 5 years now, I have received many recommendations from hundreds of people. I have a few select people that I know personally and on social media whose recommendations I have grown to trust, and many of those people have repeatedly told me to try Sizzle Pi in Kingston. Quite frankly, there are only a handful of "must try bucket list" pizzas left in NEPA that are left for me based solely on the recommendations I have received over time and Sizzle Pi was one of them. 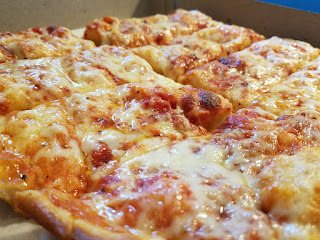 Living quite a distance from Kingston, it's been a challenge for me to get there, but after having an appointment in town, I made it a point to finally stop in and give this highly regarded, yet little known pizzeria a try. I set my GPS to take me there and when google told me my destination was on the right, I couldn't believe that the building I was about to enter was a pizzeria! 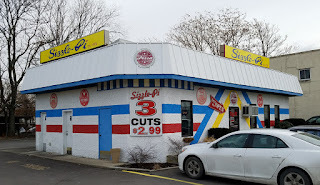 It was a neat little building that resembled a boardwalk surf shop or an old-time Long John Silvers, but the "Sizzle Pi" signage told me i was at the right place so I parked and entered. The interior matched the exterior with the throwback vibe which was so cool. Looking around, there were two small dining areas with about 8-12 booths and it looked nothing like a pizzeria which was quite possibly the most awesome thing about the experience (so far). I stepped up to the counter to place my order and I grabbed 8 "cuts" and an old school fountain lemonade just because I got caught up in the pink liquid mixing in the machine in front of me. 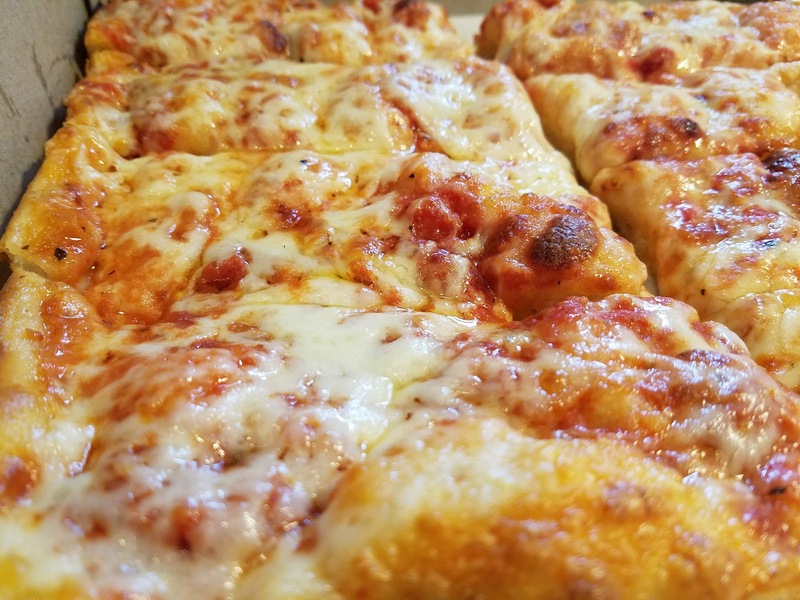 Anyone who is into pan-fried pizza in the Luzerne county area knows two things: #1 it's a delicious guilty, greasy pleasure, and #2 it's usually ungodly expensive. Taking a look at the menu board, I saw that 3 cuts of pan-fried Sicilian pizza was only $2.99 - less than a buck a slice! This is totally unheard of, because many places charge nearly $20 for a 14 cut pizza so at a dollar a slice this is an extreme value. 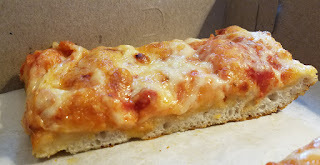 My visit was during lunch hour on a Friday, so I anticipated a bit of a wait as pan-fried Sicilian has among the longest cooking times as far as pizza genres go. To my surprise, my order was ready in mere seconds. I ordered some extra to go because I wanted to take some home for the first lady of NEPA Pizza to try, but also because I'm told that Sizzle Pi pizza has "two peaks." The first is when it's fresh, and the second is after about 4 hours cold which I'll talk more about in a minute. I took my pizza to one of the little wooden booths to try it out. 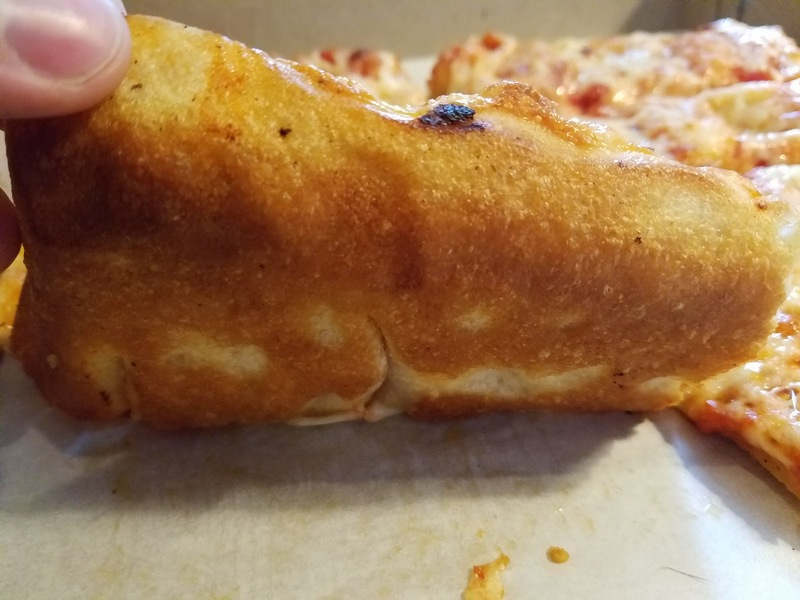 I figured I'd like the pizza because it was so darn cheap and it was cooked in peanut oil because it is light on the wallet and heavy on the flavor. Upon first look, I was very impressed with the presentation. The cheese was beautifully browned and almost caramelized on top with some vibrant red sauce peeking through here and there. The crust was nicely browned and the whole thing just looked and smelled terrific. I took my first bite and immediately fell in love with this pizza. 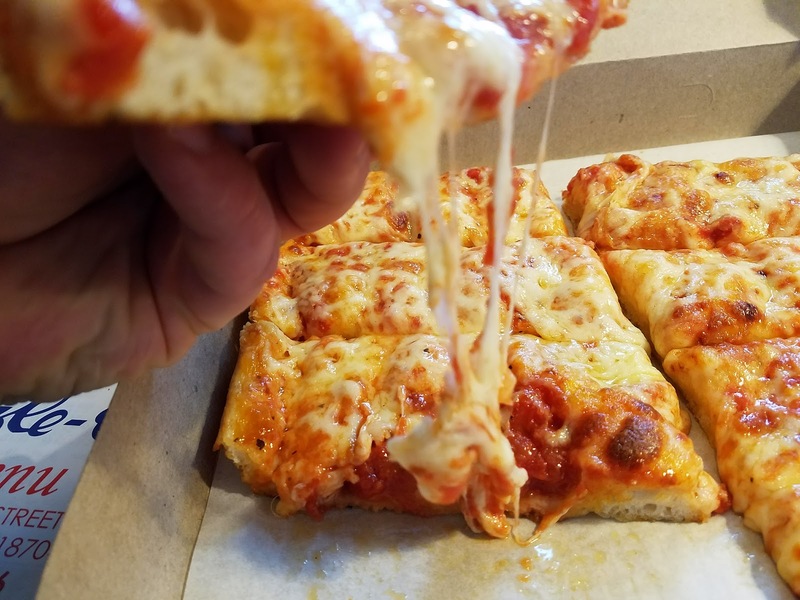 The crust was incredibly light and tender with a whole lot of flavor, and not too much oil which is usually a greasy trademark of a pan-fried pizza. It was equal parts crispy and chewy which was just a fabulous combination. The sauce was the best I've had on a pan-fried Sicilian as the onions appeared to have been cooked into the sauce creating a much smoother taste than many of the other pan-fried pizzas that have a simpler crushed tomato sauce with fresh onions sprinkled on top (but under the cheese). For those who don't like onions, let me just say, yes you can taste them, and yes there are some chunks in the sauce, but the flavors work so well, you might want to just give it a chance! The cheese provided a certain creaminess and a slight saltiness that pulled the whole thing together. As someone who has tried hundreds and hundreds of pizzas across NEPA, it's rare that I sit in a booth totally astonished by a pizza, but this was one of those seminal pizza moments where I know I was in the presence of something special in the most unlikely of locations. I knew before I finished my first slice that I would be awarding just the third 5-star perfect score in NEPA Pizza history! I truly enjoyed Sizzle Pi, and I have to thank all of those who pushed me to finally get there to try this great pizza. I think this would be a great lunch spot, not that I wouldn't eat dinner there, but it seems to be more of a lunch/takeout type of place. If I lived in the area, I'd be a regular at Sizzle Pi because it's a great little small business that seems to care about their customers, keeps its prices down, and most importantly has great pizza. 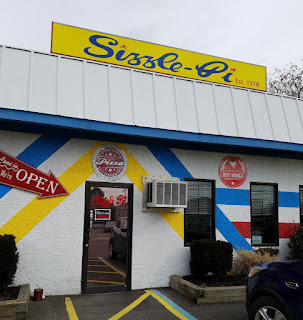 I'd also recommend you order from Sizzle Pi for your next get together or party. I think I've said it all, but in closing, I give the NEPA Nation my highest recommendation to try this place out! UPDATE: I tried the pizza about 4 hours later cold, and it was still awesome! I also tried it the next day heated up in the toaster oven and it was excellent too. Really good stuff hot, cold, and reheated!